ARTICLE 19 is concerned that in the Russian Federation, freedom of expression on the Internet is under attack, contrary to this Council’s commitment four years ago to ensure “the same rights that people have offline must also be protected online”. Since 2010, a successive string of laws have severely extended government control over the Internet, impacting the global free flow of information and resonating beyond the country’s borders. The government exerts increased pressure on domestic and international private ICT actors through harsh laws that make them legally responsible for failing to remove or block access to content. Since November 2012, Roskomnadzor, the federal body responsible for regulating mass communication, has maintained an Internet Blacklist and has the power to extra-judicially order ICT companies to block webpages they deem illegal. Failure to comply within 24 hours results in blocking, but with network providers often unable to isolate the offending material, access to entire websites, or group of sites, are unjustly restricted. Local civic group RosKomSvoboda estimates while more than 30,000 online resources are currently blacklisted, more than 500,000 websites are inaccessible as a result of over-blocking. Independent media outlets Grani.ru, Everyday Journal (ej.ru) and Kasparov.ru have been permanently blocked in Russia without clear reasons since March 2014. Fear of blocking incentivises media and other companies to speedily comply with authorities’ demands for content removal. Content is often targeted on ambiguous bases contrary to international human rights law, including for “spreading extremism”, religious insult, calls for separatism, swearing, and LGBTI-related content. Media outlets are further challenged by the fact that if they receive two official warnings for violating the law within a 12 month period it is sufficient for the authority to revoke a media organisation’s official registration, effectively forcing them to close. Internet users, especially on social media, are also targeted. Since 2014, bloggers with more than 3,000 followers have been required to register and comply with restrictive media legislation. In the last year, several social media users have been prosecuted for legitimate online expression. The 2015 Data Localisation Law seeksto extend the government’s reach over private ICT actors by requiring them to store personal data of Russian citizens on servers in Russia. A new bill adopted by the Russian Parliament this month will, if enacted, require news aggregators to check the ‘truthfulness’ of articles they link to in search results, with heavy fines and blocking for failure to comply. We urge the Russian Federation to protect freedom of expression online, and repeal legislation that does not comply with international human rights law. 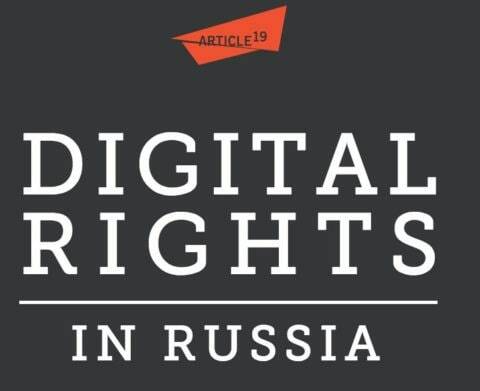 On 15 June 2016, ARTICLE 19 launched an interactive online timeline – “Digital Rights in Russia” – documenting the significant changes to legislation in Russia affecting freedom of expression online since 2010. Illustrating the broader context in which this occurred, the timeline demonstrates the Russian authorities’ increasingly reactive and excessive attempts to restrict online expression and the public’s right to know.